Save $5 on Paramount's animated hit by pre-ordering from Amazon! 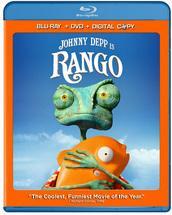 The online retailer is currently offering the chance to save an additional $5 on 'Rango' Blu-ray available on July 15! Simply visit this page to add the Blu-ray to your shopping cart at Amazon and enter the code RANGO5GO during checkout. There's no word how long this coupon will be available so be sure to order your copy as quick as you can!